From the Adobe FormsCentral forum, this discussion came up recently. 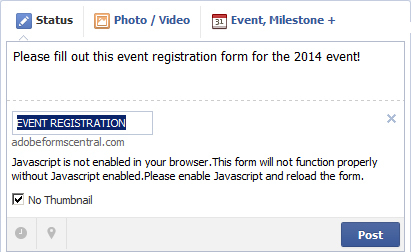 How can I allow possible registrants to fill our a form on facebook? Does anyone know how I can allow access to this form to anyone on Facebook or by email? FormsCentral allows you to create both HTML and PDF forms but in this post I’ll just cover how to do this for HTML forms. If you need to do this with a PDF form, check out my blog on How to upload a PDF file to Facebook. 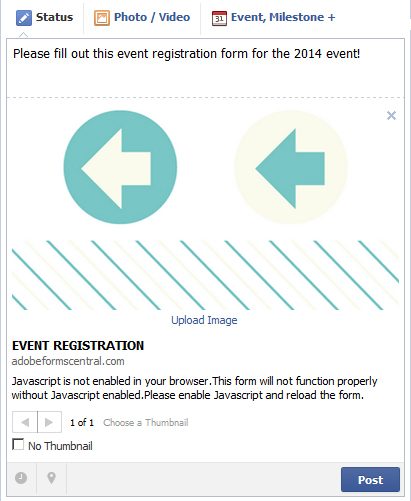 FormsCentral also allows you to embed HTML forms (not PDF forms) but you cannot use the embed code in Facebook. To start, I’ll log in to FormsCentral, click on the Create New Form tab and grab an existing Registration template. To do this select the Registration category, click on a form, and select Use Template. Add any additional design elements and options you need on the form. Click on the Distribute tab and select the Open button under the Form State. Next, click on the Copy Link button with the Web Form tab selected. Open your Facebook page and paste the link into a status update (don’t hit Post yet). A thumbnail preview is automatically included, so you can delete the long URL at the top and add your own text. If you don’t want a thumbnail, check the No Thumbnail box. If you want to customize the link title, hover over the name until it highlights in yellow and then click on the text to change it.